On the go and suddenly remember you didn’t send a Valentine’s Day greeting to a loved one? The Valentine Wishes app has got you covered. Featuring a saccharine-sweet soundtrack and plenty of pink, this app certainly looks like it was designed for V-Day, and the cards available are mostly worded in such a romantic way that you wouldn’t want to send them to casual friends. You can buy all the e-cards outright, or play games to unlock them. There are four game modes: Shoot It, Catch It, Tap It, and Stop It. 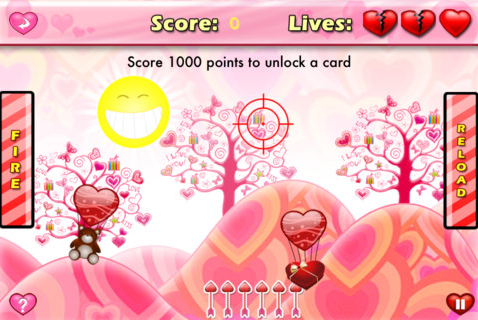 Shoot It involves tilting the screen to place crosshairs over some heart-shaped balloons. Hit 1000 points (10 balloons) and you unlock a card. However, miss more than three balloons as they fly across the screen, and it’s game over. This game has actually got a surprisingly high level of difficulty, and may just keep you entertained (or cursing with frustration) for a while. Catch It, on the other hand, is stupidly easy, and catching the hearts dropped by cherubs above should quickly net you at least five unlocked cards on your first go. 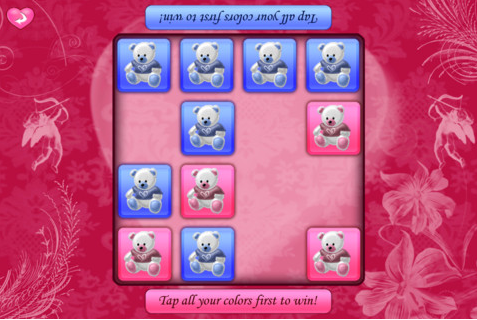 Tap It mode can be played with two players, each of whom must tap tiles that match their assigned color. 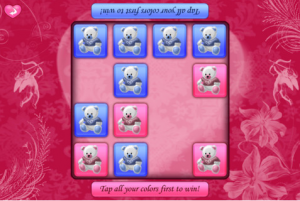 First player to tap all the tiles wins the game. There’s a little more replay value to this game mode, since it lets you interact with another person across the table from you. Stop It mode could have just as easily been called Tap It mode, as all it involves is tapping hearts on the screen as they fall. It’s about as challenging as Catch It mode, and just about as fun. Should these simple games prove too taxing, however, you have the option to pay to unlock all the cards. But with such easy, straightforward gameplay, we can’t imagine too many people will actually be paying for the cards. Unless you’re in a real hurry, or you really don’t like the cards you’ve unlocked so far. The cards themselves can be emailed from the app to your significant other, though the occasional typo on the cards may cause you to pause before hitting send. If you need some mindless, holiday-specific fun to kill time with on your commute (or while waiting for your blind date to show up), this app’s got what you need. Requirements: Valentine Wishes is compatible with iPhone, iPod touch, and iPad. Requires iOS 3.1 or later. A small expedite fee was paid by the developer to speed up the publication of this review.